Please be patient if there is a moment of quiet reflection recorded before the preacher begins. To download the sermon to your computer or device, click the download button on the right. Sermons before 17th September 2017 are temporarily unavailable on the website but can be sent by e-mail on request to drbbscott@aol.com. Reformation 500 Conference – Why was the Reformation necessary? Who is the Good Samaritan in the parable? Fourth in series, ‘Miracles of Meaning’: Healing of the lepers – how thankful are we for what Christ has done? Second in series, ‘Miracles of Meaning’: Healing at the Pool of Bethesda – what do YOU want? The Resurrection – fake news or what? In this series we look at 4 of Jesus’ Parables of Passion. If you want to access the recordings of this series, click here. In this series we study 4 sections of The Sermon on the Mount. If you want to access the recordings of this series, click here. From time to time members give their testimony in the morning service. Four given since 2016 are recorded here. If you want to access the recordings of this series, click here. In this series we study 4 petitions of The Lord’s Prayer. If you want to access the recordings of this series, click here. In this series we study a selection of Psalms. If you want to access the recordings of this series, click here. A series of four sermons on evangelism. To access the sermons click here. A series of eight sermons exploring The letters of Peter, preached during October 2015 and January 2016. If you want to access the recordings of this series, click here. 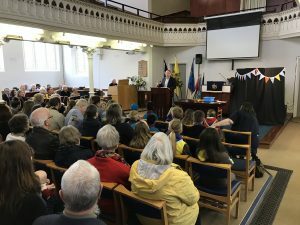 A series of three sermons by our minister encouraging us not to be limited in our approach to God with regards to Our awe of Him; Our devotion to Him; Our worship, but to ‘be lost in wonder, love and praise’. Preached between August and October 2015. If you want to access the recordings of this series, click here. In John’s Gospel Jesus tells us who he is in seven ‘I am’ statements. Between April and August we had sermons on each one. If you want to access the recordings of this series, click here. We consider ten of the many wonderful attributes of God: trying to better understand and appreciate the scope of God’s nature so we might better worship Him. Click here to access the recordings of this series. This series covers important aspects of our discipleship. Recordings are available here. To access the morning and evening sermons on Easter Day, click here. PRAYER In October 2014 we looked at four different aspects of Prayer. The recordings are available here.